The South Stand is ready, the pitch is ready, the players are ready—are you ready? Because the Cathay Pacific / HSBC Hong Kong Sevens is almost here, and you need to be prepared. Not just for the non-stop tries and ridiculous antics, but for what comes after, the legendary after-party, hosted by yours truly. 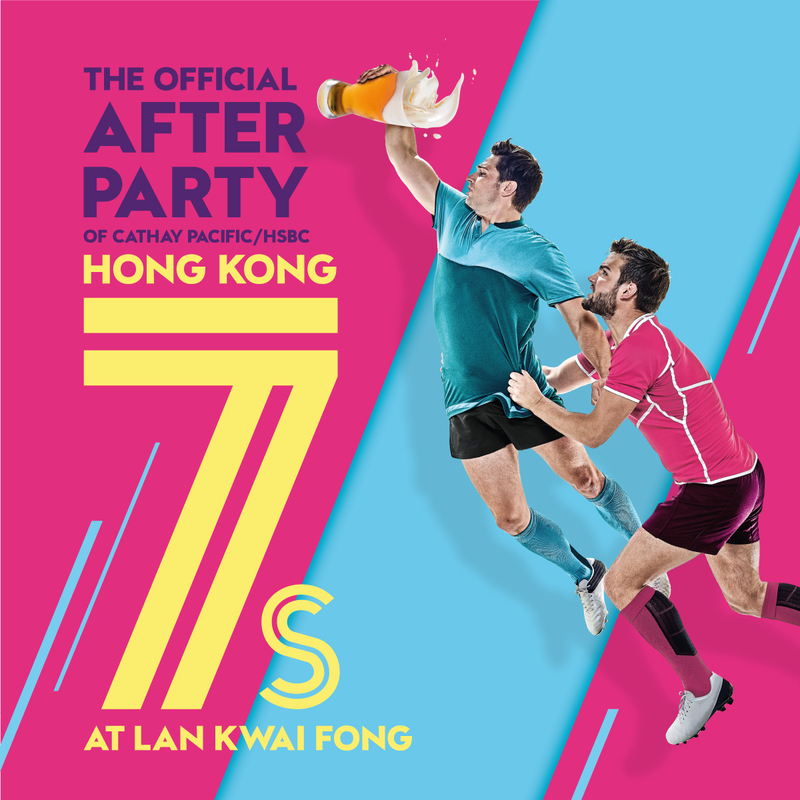 The Official Hong Kong Sevens After Party at Lan Kwai Fong is a once-a-year extravaganza you don’t want to miss, where the famous Lan Kwai Fong streets are transformed into a rugby lovers’ paradise. There will be games, live entertainment and plenty of photo opportunities around every corner, last year we even had a parade! And of course, there are a whole host of other exciting events happening around the city for Rugby 7s, here are a few of our favourites. And keep an eye on the official Rugby 7s website for more exciting events happening next month. You don’t even need to be in the stadium to have a killer time this Sevens, just head to Sevens Central at the Central Harbourfront. The gates open at noon, and you can spend the day watching the matches live on the big screen, or chilling out to some tribute bands, like Pink, Queen, Oasis and even The Rolling Stones (and it’s all free!). Then when you’re done, head over to Lan Kwai Fong to party the night away. Sevens Central is happening 6 – 7 April, 2019 at Central Harbourfront, from 12pm – 10pm. Entrance is free, and you can find more information here. While we love a good tribute act, there’s nothing better than seeing the real thing. And this year, you can see the Hollaback Girl herself live in Hong Kong. Marriott Bonvoy is bringing Gwen Stefani to the Central Harbourfront for an exclusive performance on 5 April, 2019. This will the three0time GRAMMY winner’s first time back in Hong Kong in over a decade, and is sure to be an incredible performance. Gwen Stefani is performing at Central Habourfront on 5 April, 2019. Tickets are HK$780 and are on sale now through Ticketflap. For more information, click here. For a totally different kind of experience, head to the Cathay Pacific/HSBC Hong Kong Sevens Festival at Lee Gardens in Causeway Bay. For three days only, the luxury mall you love will be turned into an interactive paradise for the whole family, with state-of-the-art ninja courses to test your own athletic prowess, street performers and, of course, all the rugby action broadcasted live onto huge screens so you don’t miss a moment of play. The Cathay Pacific/HSBC Hong Kong Sevens Festival at Lee Gardens runs 5-7 April, from 11am-7pm. Check out all the details here! Lan Kwai Fong is giving away two three-day passes (valued at HK$2,250 a person!) soon – so watch this space for a chance to win your free pass to three days of the world’s best rugby!